*Lightly-raced eight-year-old who will be carrying top-weight of 11st 10lb in the £1-million Randox Health Grand National at Aintree - 5.15pm, Saturday, April 14. *Reported as having wind surgery on February 7. *Winless in four outings so far this season, most recently falling at the last when well-beaten in the Irish Gold Cup at Leopardstown on February 4. *Career-best performance came when runner-up to Sizing John in the G1 Timico Cheltenham Gold Cup in March, 2017. *Fell at the last (when racing in second) on only previous visit to Aintree in a Listed chase over three miles and one furlong on the Mildmay Course in December, 2016. *Last victory came when defeating Native River (the 2018 Timico Cheltenham Gold Cup winner) in the four-mile National Hunt Chase at the Cheltenham Festival in March, 2016. 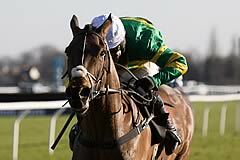 *Trainer and owner combined to win their first Grand National in 2010 courtesy of Don't Push It, ridden by A P McCoy. Born: March 10, 1951 in Co Limerick, Ireland. Background: John Patrick 'J P' McManus attended the Christian Brothers School on Sexton Street, Limerick. He left his father's plant hire business at the age of 20 to become a racecourse bookmaker, but then took the less well-trodden route of gamekeeper-turned-poacher when becoming a professional punter. McManus recalls one of his first bets as being on Merryman II in the 1960 Grand National when he was just nine, but the bet that changed his life was £4 on Linden Tree in a Newmarket maiden in 1970, the horse winning at 100/8. He had another £4 on when Linden Tree won the Observer Gold Cup at 25/1, and £5 each-way at 33/1 for the Derby, when the horse beat all bar Mill Reef. He was dubbed "the Sundance Kid" by journalist Hugh McIlvanney after landing a number of major gambles during the 1970s. McManus has a host of business interests including dealing on the financial markets from his Geneva, Switzerland, base (since circa 1994), part-ownership of the Sandy Lane Hotel in Barbados, where he also has a house and an extensive global property portfolio. With Coolmore supremo John Magnier, he bought a 28.7% stake in Manchester United through the Cubic Expression company before subsequently selling out to US tycoon Malcolm Glazer in 2005. He was in the news shortly after that because of his stake in the pub and restaurant operator Mitchells and Butler. In 2017, the Sunday Times estimated McManus' wealth at £917 million, making him the 12th richest person in Ireland. Racing interests: McManus purchased his first racehorse, Cill Dara, at the age of 26 and is the biggest Jump owner in terms of numbers in Britain and Ireland, with some 400 horses in training. He owns Jackdaws Castle, the Gloucestershire yard that Jonjo O'Neill trains from, and has invested heavily in improving facilities since purchasing the property in 2001. Mister Donovan provided him with his first Cheltenham Festival success in the 1982 Sun Alliance Novices' Hurdle and McManus has enjoyed 54 winners in total at the meeting - including a record seven victories in the G1 Unibet Champion Hurdle - far more than any other owner. He has also won a G1 Cheltenham Gold Cup with Synchronised (2012) and three G1 Stayers' Hurdles with Baracouda (2002 & 2003) and More Of That (2014). A full 28 years after his first runner in the race, McManus finally achieved a long-held ambition when Don't Push It, trained by Jonjo O'Neill and ridden by A P McCoy, won the 2010 Grand National. He has had plenty of horses placed in the Randox Health Grand National too as well lots of success during the Randox Health Grand National Festival. He has been British champion Jump owner nine times - 2005/6, 2006/7, 2008/9, 2009/10, 2011/12, 2012/13, 2013/14, 2014/15 & 2016/17 seasons. He retained record-breaking 20-time champion Jump jockey A P McCoy as his main jockey from April, 2004 until the rider's retirement in April, 2015. Barry Geraghty took over that position, with McCoy having an advisory role. Frank Berry is the longstanding McManus racing manager. McManus bought Martinstown Stud, Co. Limerick, in 1982 and built a big mansion there in 2004. Other interests: McManus does a lot of work for charity, including his Pro-Am golf tournament, which takes place every five years (it will staged next in 2020) and has raised over 140 million euros. He supports many charitable projects in Co Limerick. McManus is also a keen backgammon player and a big hurling fan. Personal life: He is married to Noreen and they have three children, John, Kieran and Sue Ann.